Here's a note from Palomino. Honey Bandit finally has his "BAND," his own little "family", made up of the two minis and Suri. It is wonderful to see the four of them playing together and watch the interaction as they each find their own place in the pecking order. It won't be long before Princess Suri rules, as she will definitely be the lead mare. When Suri gets tired of DaBubbles, she backs up, nearly sitting on him. Then she bottom-bumps him. That little girl has attitude and she's recovering energy. For a baby her age, she is as fast as lightning. Honey Bandit is amazing. He is so beautiful and just continues to improve. His big strong neck is almost "studly". 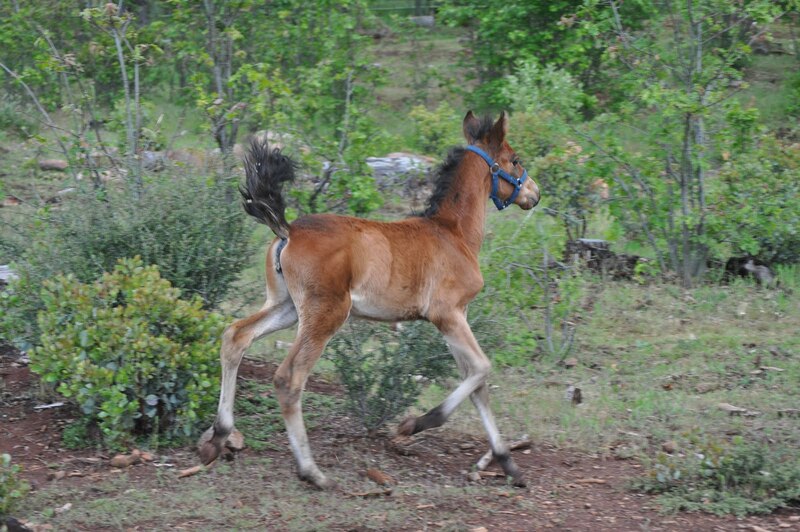 When he arches it and does his little prance, you can feel the power he has as he moves beside you. He has come so far from the pile of bones and carcass, and continues to grow bigger and stronger daily. He is going to be a very solid horse. Wouldn't it be great if, someday, we're able to ride him as he runs across the land. For now, he is safe and happy and well, thanks to all of you. We are still trying to raise funds for Suri's surgery, and I want to thank everyone who has helped our rescue and these beautiful babies. Wales tops the list of places I would love to visit. The land and language call out to me in ways I can't explain. I only know it feels like the cry of a bagpipe sounds. Because you like my stories, you might share this feeling and enjoy this article. I only feel a little sad that so many humans insist on stamping a $ value on things which with worth all their own. Go visit Wild Mountain Ponies here, and if you see them on the moors, blow them a kiss from me. Suri is doing fabulous. She is getting more energy, growing like a weed and becoming fast friends with DaBubbles. Had a scare the other day when DaBubbles grabbed her hernia in his mouth. Not sure whether it is instinct that told him not to bite hard or just angels from above. Suri has gotten stuck in the panels twice. She simply rolls over when she is getting her "sun bath". She was so good though. She had her top and bottom hind legs quite a ways under and through the panel, (she was on her side) but she just hung out quietly for a couple of minutes while she waited for us to get there. Shows what a smart little girl she is. Her cough is getting much less noticeable and she is doing better and better letting us lift her feet with very little fuss. For those of you who are not too familiar with horses and why this is a big deal, the reason is this. When a horse doesn't "have it's feet" (all four on the ground) they cannot choose their option of flight. Horses have two options when their lives are threatened or they are scared. "Flight or Fight". If they can't leave, their instinct is to fight. It is not as much in the forefront of the domestic horse's mind, but the mustangs live by being smart and their survival skills, which means "keeping their feet" on the ground. The mustangs survival skills are obviously much more honed and quickly acted upon. This is one reason why people should not turn their domestic horses out to survive on their own when they cannot afford to feed them, as they are not equipped. Their survival skills are buried under years of coddling. Honey Bandit is doing very well, although I think he misses all the time we spent together. (Or maybe that is just me hoping that he misses it as much as i do - ha ha). He is a very healthy guy, although his brain is still finishing up the rewiring process. He & Patches are hanging out together. As soon as he can kick a bit better and is a little more sure footed, he will get to start hanging out with Chilly Pepper and Dakota. After talking to the vet, we decided to let him get a little more surefooted and the ability to "let fly" before we put him in with the big guys. That way he can boot scoot out of the way if he needs to. With luck, I'm getting back to daily blogs. I've had fun at the Horse Expo (little horse lover is fingerpainting friendly Arabian in photo) & watching the drill teams and barrel racers at the Reno Rodeo (here's a link to a teeny video tweeted by a University of Nevada student :Arena Autograph party but it's time to crawl back into my own little writing corner and do something for you & our wild horses and burros. They need us. Here are some quick updates from Palomino. > It is amazing what prayers and love can do for a little orphan. Yesterday we took Suri out into the round pen. The weather has been horrible, rainy and cold, dreary and gray.So we grabbed the few minutes of "no rain" that we could and brought Suri out into the round pen. She was ready to go and bucked and ran and slam, slid right onto her side. She had her blanket on, so she slid several feet and got up and started again Twice more she went mud diving..then her little brain was churning and when she started to run you could see the difference in the way she placed her feet. After that, it was bucking and running and sliding to a stop right at the last minute. That little girl is smart. >Today, we took her to the lower field and she had a blast. She ran and ran and ran. Her tail was up and that little girl can float without even touching her feet to the ground. She is poetry in motion, but we could tell that she was left repeatedly by her band, as she is in constant communication with us, never letting us out of her sight. Also from Palomino: Suri still needs prayers, but is doing wonderfully compared to her start in life. We appreciate all your support as we have to get this little Princess ready to be adopted by some lucky person. I have to say that whomever is lucky enough to adopt her will need to spend some serious time with her here as she has been "left" by the bands over and over. She definitely is concerned about being left behind. But she is the biggest love you will ever meet. I can't wait till she and Honey Bandit can run and play. I'm sharing this cool book review NOT just because of Balto's amazing story, not because you'll be touched by the neglect, abuse and eventual rescue that followed his heroism, but as a sort of an example. If you're a student, you've probably been asked to write book reviews. If you find yourself saying "I liked reading the book, but I don't want to write about it!" save this review as example of how the "why" of your feelings about a book can make the review GREAT. If you're not a student, I promise you'll appreciate the contemporary connections the reviewer makes. mistreatment thanks to a public fundraising campaign. the dogs and move them to where they would be provided better care. themselves, make this a must-have book. run the Iditarod several times. some of the weak are left behind by the side of the trail." eighty-five years ago. Just like I do. P.S. Do you know any TRUE STORIES of other brave dogs? This orphan will make you smile! This little mustang is surrounded by affection. Watch the dog celebrate with a wide "smile" and wagging tail & Matt watching and touching the foal. Best of all, listen to Palomino's voice. I'd like to blame the snowy northern Nevada weather and say that I FORGOT it was almost time for my June newsletter, but that's not exactly true. I've been working on it all day! 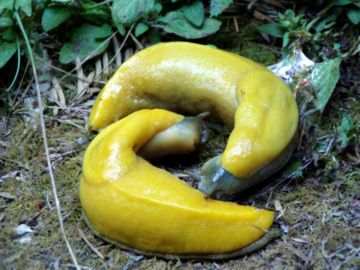 The next newsletter should be out before the weekend and it will feature some cool stuff, including world famous authors in BANANA SLUG SUITS!